We’re happy Lukas has joined us at Team Swapit about 2 weeks ago! Lukas is actually studying IT and Communication Technology at the Technical University of Denmark, so he will do a 5 month internship at Swapit. Without spoiling too much of what’s to come, Lukas is working on some pretty exciting topic that will demonstrate the kind of innovation Swapit is bringing to the world of C2C marketplaces. While traditionally, C2C marketplaces come with a bit of dry sort of classifieds experience, we at Swapit know, we can provide a much more engaging experience for everyone. I won’t tell you more about it right now, but we will definitely have another blog post about his work here on our Swapit blog. So better make sure you’re signed up for our email updates (select “follow by email”)! Stay tuned! More info to come soon! It’s almost summer time and that means to give students across town a chance to see what it’s like to be working at Swapit. This week, we did welcome Jonathan who is currently studying at the University of Hong Kong. He’ll be helping out in the field of marketing, PR and media. Especially with RISE kicking off next week, we can definitely use some help. It is the biggest startup conference in Asia, Swapit has a BETA booth there, was selected for PITCH and BREAKTHROUGH competitions, we’ve got Mentor Hours, investor Office Hours, Night Crawls, workshops, seminars, and so on. It will definitely be a busy week. Maybe two months ago, I was pitching at Cyberport for the e27 Echelon Summit 2016. While in the end, we were invited to exhibit at Echelon in Singapore, we decided to focus entirely on RISE for now. Yet, on that day at Cyberport, Jonathan came up to me and we talked for a bit. It was great to see him being excited about Swapit. Now, a short while later, he’s here with us preparing for RISE and all the other events that are coming up. I am sure it will be a great few months and he’ll have learned some of our tricks and secret sauce to keep our traction numbers up and continue to grow rapidly. Have you tried Swapit yet? Go to http://get.swapit.la and download it for free. 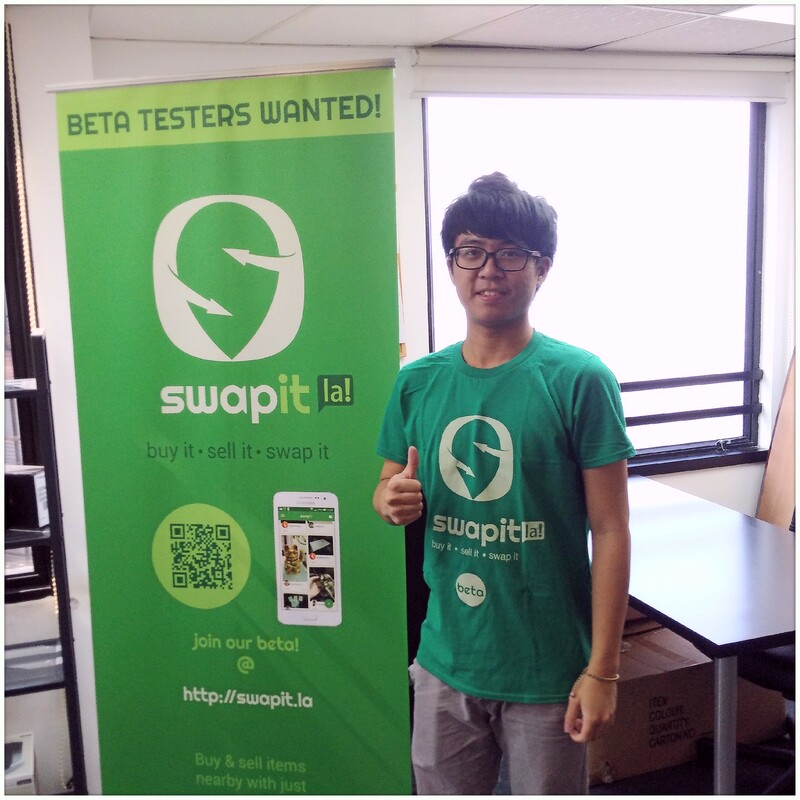 The swapit team welcomes our newest team member Kevin! Kevin is currently graduating from Hong Kong University and has approached us at the CoCoon Pitch Final event 2 weeks ago. His immediate thought when seeing swapit was that it is perfect students. Especially for international students like himself, who move in and out of their student halls / apartments nearby campus. Such waves of student migration seem to happen twice a year around the end of the old and start of the new semester. So swapit is an obvious and very useful tool students could take advantage of when moving out their place and wanting to get rid of their stuff. At the same time, students who are just moving in, are the perfect buyers of those pre-loved items the older students want to sell off. While they all don’t know each other yet and at the same time they are mostly in very close locations (think student halls and dormitories), swapit can be the perfect discovery tool for them. So yes, Kevin convinced me there is a valid target audience in these halls and I absolutely agree to his arguments. As a result, Kevin will reach out to all universities in Hong Kong (there are a lot actually) to offer swapit to their students, helping them to trade their pre-loved items. We recently updated our website http://swapit.la with a team profile. If you have been following our blog for a while you might have noticed that the presentation we held at the Hong Kong ICT Awards 2015 was sporting a slide with the team in it. Stay tuned for more news about our swapit beta 2 which will launch very soon.